More than 4,200 Parsis have so far given their blood samples for a genome project that aims at a comprehensive study of Zoroastrian individuals to explore the genetic basis of their longevity and higher incidence of breast cancer among their women. The first focus of the analysis would be breast cancer and diabetes. "The output of this work should be visible in 2011 on these two specific areas," said Dr Villoo Morawala-Patell, a Parsi and the brain behind the project. Villoo said she expects to collect the blood samples of 15,000-20,000 Parsis of the total population of 67,000 in India by March next year. About 40 to 50 bio-informatics scientists are currently working on the project. The project also aims at creating a genetic, genealogical and a medical database of India's Parsi population, whose religion forbids marriage outside the community. The database would help develop unique biomarkers for universal use. Launched on October 1, 2007, the project now appears set to involve interested public and private sector players as the scale gets bigger and wider, after being driven by city-based biotechnology firm Avesthagen, of which Villoo is the chairperson and managing director. "Things are looking interesting," said Villoo, adding, "We will be looking at it (Avesthagenome project) in a bigger way, opening up to potentially both the public and the private sector". When the population genetics and systems biology study on the Parsis was conceptualised, it was thought that the venture may require $30 million at the 'first cut' with the initial funds of Avesthagen in terms of collecting blood samples, data mining and the first few discoveries. But now it looks like the scope of this 'landmark and humongous' project is bound to expand and 'more and more things could flow out from data mining', with immense commercial opportunities. Villoo expects the discoveries from the project -- a genetic study to map hereditary diseases associated with the Parsi bloodline -- to benefit the world at large. 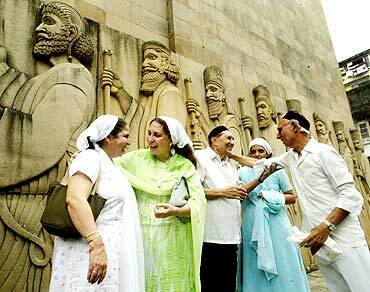 "Parsi population is an in-bred population. The reason why we took the population is because it sits at the bridge between the East and the West, and having come from Persia in terms of caucuses, from where both societies emerged eventually," she said. The in-bred nature of the small community provides an easy access to genetics and in understanding genetics. "But the output of genetics will be useful for both Indians and internationally, the whole world actually," Villoo said. She said the funding for the project going forward is going to be high. "Putting it in a public-private structure and seeking funds for it from both the government and the private sector will be an appropriate move. So it's important that we do it in the right way," Villoo said. She said a lot of people (in public and private sectors) have expressed interest in the project. " On the cost of the project, she said, "It will be $30 million for the next three-four years, after that we may need another $30 million, $100 million if you go for it, all the way through". The idea now is put the project on an ongoing basis in the private-public domain and create Avesthagen Institute of Life Sciences, attract students and promote academic and monetary partnerships with the company holding the right to commercialise the output. Rita Colwell, former director of National Science Foundation, USA, finds the project very exciting and says it offers an opportunity for India to be right there in the forefront in understanding the human genome and the genomic revolution. "Because it's a population which can be circumscribed and the migratory history and medical histories and chronology of the families can be documented pretty much like the study in Iceland (where there is already a national genetic database) and in Norway", said Colwell. Colwell, who is also chairperson of Avesthagen's strategic advisory board, said the project attempts to document genetic locations and genes and tie them to given health conditions. "It's a population that has a positive characteristic and as I understand, living to an old age is one of the characteristics, what are the genes associated with the ability to live to an age of 90-95," she said. On the unfortunate side is the higher incidence of breast cancer among women, noted Colwell, chairman of Canon US Life Sciences, Inc., and Distinguished University Professor at the University of Maryland at College Park and at Johns Hopkins University Bloomberg School of Public Health. "So it would be very useful to determine those genes associated with breast cancer, the ones we know are present and are there other characteristics and genes that are associated with it and more importantly, are there drugs to which this population would respond much more beneficially and the treatment would be much more precise way", she said. The project incorporates genotyping, and the integrative analysis of transcriptomics, proteomics, metabolomics and stem cells from the blood of volunteers with the aim of identifying biomarkers and disease targets. Once completed, Avesthagen expects this project to have one of the largest global impacts on genetic mapping because of the Parsis' close genetic connection to both the original settlers in India as well as remarkable genetic similarity to European and Middle-Eastern populations. Through mapping of this unique DNA sequence and the compilation of medical, nutritional and socio-economic data, Avesthagen would control one of the most valuable and comprehensive databases ever compiled. "This library will help further internal drug development capabilities, global licensing and partnership collaborations as well as generating revenue through diagnostic and data sales," according to the company.